Oh hi! I'm back, but you know what else is back? Football season. Oh yes, football season is one of my favorite times of the year because Sundays are dedicated to both bumming on the couch and out of control finger food. Last year I brought you three solid recipes for football season, my killer pastrami nachos, herb pesto arancini, and one of the most popular recipes on my blog to date, sausage, peppers + onions pigs in a blanket. But this year I wanted to class up your typical football eats for some fancy finger food with these tricolor potato pancakes. And since football eats need to have something creamy, a horseradish cream is smothered on top! They're a tiny bit fussy, but they're also perfect finger food. But surprise! You don't just get one recipe today because I teamed up with 18 other bloggers to bring you a total of 19 incredible recipes for football tailgating. There are some true gems here which you have to try out, like Easy potato chip nachos from Honey and Birch and Pumpkin pulled pork bowls by The Speckled Palate. Don't even get me started about Feast + West's Chorizo-stuffed bacon wrapped dates. Oh my, oh my. The options here are incredible! Find links to all of the recipe plus my full recipe below. Start by shredding the potatoes. You can use a hand grater, or to make it even easier, the shredder attachment of an electric mixer. Add the shallot as well to shred it. Drain the potatoes and shallot by squeezing out all of the liquid using a cheesecloth or a few paper towels. The less moisture, the better for frying. 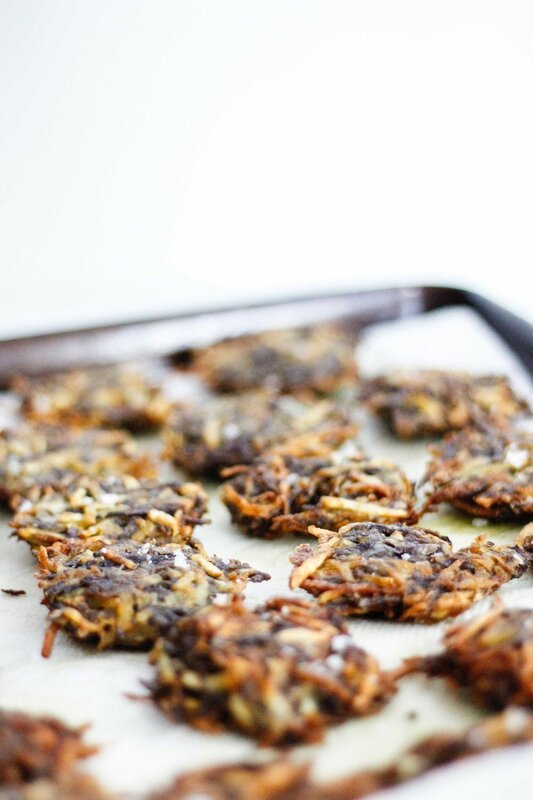 To make the potato pancake mixture, combine the shredded potatoes/shallot with the egg and flour. Now it’s time for frying. Heat a large pan on medium heat and add enough oil for a shallow fry. To make each pancake use an ice cream scoop to form a very packed ball of the mixture. Squish the ball until flat and gently place each pancake in the oil. You’ll want to do this in batches until you run out of the potato mixture. Have patience, you’ll want to flip each pancake once they are very crispy on one side. Then flip them again to crisp up the other side. Sprinkle some salt on each potato pancake when it’s remove from the oil. To make the horseradish cream, combine the sour cream with the prepared horseradish and a generous pinch of black pepper. Top each potato pancake with a generous scoop of horseradish cream and a few cherry tomato halves. Note: This post is in no way sponsored, endorsed or administered by the National Football League (NFL) or any of its teams. All opinions and views expressed are our own, not that of the NFL and/or any of its teams. Any team names, logos or other symbols referenced are properties of their respective organizations.